Anything else is just a bonus now, currently sat in 7th with 5 games remaining. Bookies favourite to go down, and we've surprised everyone. Over-acheivement? Personally, I don't think so. We performed consistently throughout most of the season, and if it wasn't for a small blip throughout April and March, we'd probably have qualified for the Champions League. More than happy with a 7th place finish though, a very profitable season for the club as a whole in every single aspect. If it wasn't for a late winner from Bournemouth in their match on the final day, we would be in the Europa League next season. There is still however a chance of qualification into the Third Knockout Round, providing Man City do the cup double. My player of the season is Felix Klaus. Signed at the beginning of the season, and has been crucial with his runs down the wing, and his ability to cut inside and score goals. Result of the season? You might be able to remember me posting this one - Don't think I will ever match it... Crazy stuff. Out of our 19 Home league matches this season, our stadium was a sell out for 18 of them. With our recent expansion, the stadiums capacity sits at 27,000.. I think we might need a few more seats. Chuffed would be an understatement. Bring it on! Yep. Guy got a decent raise as he was still at Benfica on 1,7k per week. Congrats to you Mike, great achievement! Not a bad guess at all sammo, all three are players I would have thought about...but wrong. I tried to pick Courihane and Scowen up on free transfers this summer, but they wanted £7k p/w and £12k p/w respectively. Even after promotion clauses, my maximum earner is on £6k p/w. I don't really plan on making any more significant signings so I'll post a small pre-season update now. I didn't want to make any dramatic changes to the first team. My target was to put a squad together with more depth, to help deal with the fixture congestion we will no doubt encounter this season - providing we progress from the Europa League play-off stage! Very pleased with the signing of Shawcross. A proven, top flight English defender who will bring quality and experience to our team. Arellano is a young, hungry full back (Natural wing back too). He will challenge Tyrone Mings right from the off for a first team spot. David Raya performed consistently well in the Championship for Blackburn, and will make his first fore into top flight football. A goalkeeper was our priority signing for this window, and pleased we've got someone of his quality without having to pay a transfer fee (Out of contract). Similar style to Loris from Spurs, a 'Sweeper Keeper'. Still plenty of funds left if any emergency signings are needed. Had a slight revamp with the backroom staff too. Now have some top coaches at the club, and confident in seeing improvements in the development side of things. Out of the all the contenders we have the easiest run in on paper, Arsenal away on the last day is pretty much the only tough game left. But just before the United game we played Everton at home, which finished 0-0, again present was the problem of breaking down a stubborn defense, which feels slightly ominous. If we can match the results of the first half of the season then I'd almost expect us to finish in the top four. But I'm not exactly confident. Will be interesting. And of course we'll be playing in the league cup final against Spurs, looking to defy a poor record of three defeats and a draw in four meetings. Not expecting much, but would of course be nice to win another trophy. Very happy with all our January signings as well, especially Son and Sanches. Woahhh! 7 wins in a row Joga. We're only heading one way. First leg vs. Galatasaray at their place finished 1-1, I felt we could and probably should have won, so I figured we could have a good chance of winning and thus progressing at home in the second leg. Didn't really see this one coming though. Sat back and played on the counter for the second half, most of their possession and shots are from that half. Their first half performance was as inept as it gets from a supposedly good team in a knockout competition. Or maybe we were just too overwhelming. Disgustingly bad. Really, really terrible. As an additional bonus, Wimmer will be out for two months with a dislocated shoulder. Hopefully Real or whoever buys that Aaron John guy off Spurs so I won't have to play against him again. He's now scored five against us in two games. Finally got round to starting my first season in the premiership as Crewe after going up as Champions. Beeney is the No.1 and impressed last season in the Championship. Still young and time to improve too. Vigouroux was just brought in on a free and will provide cover. Fredericks is the first choice RB with Walker Peters being the first choice LB. If he does well I can turn his loan into a permanent deal for 7.5M. If Fredericks stays fit I imagine Darikwa will leave in January to lack of first team football and Kriz is a 19 year old regen with room to improve but I cant imagine he’ll ever make it as a first choice LB for me. Richards is now 30 but was brought in on a free and could be an important signing if he manages to stay fit. Duffy is the club captain but had some awful discipline last season and has struggled so far this time round and Akpoguma was a 1.5M buy from Hamburg who’s looked half decent so far. Was a bit worried about the lack of depth what with Duffy’s discipline and Richards injury proneness so added James Chester on a free just as cover. As you can see, quite a lot of players. I tried to offload Meyler and agreed deals with several teams but he couldn’t agree on a contract. Rabiot was disappointing on loan last season but at 2M I thought it was an opportunity I couldn’t really turn down. Gibson is actually playing on a non contract basis for now. His deal expired but I haven’t got rid yet! Mason cost me 3.4M and I’m hoping he can be the star, will add some vital experience which is needed as my squad is quite young. Powell, Traore and Musonda can all play this role but they’re probably better off further up the pitch. Lingard was the star man last season but for some reason wants to leave, despite signing a new deal. I accepted offers of 20M in the summer only for him to reject terms with Atalanta and Livorno. Graham and Zaha are the exact players I like out wide. Direct, quick and get to the byline and fire in a cross in. A bit old fashioned if you like. Roberts was a big signing for 4.5M and I’ve slowly started to integrate him into my line up and Soltani is an 18 year old regen already good enough for my first team so will be interesting to see how he gets on. Probably the weakest area of my squad. Gestede and Cummings did reasonably well in the Championship last season without setting the world alight. Neither have scored yet this season. Izzy Brown might end up playing here. I originally signed him to play on the wing but with Graham in great form and a lack of forward options I guess I’ll give him some opportunites. He got 8 in 28 at Burnley last season so that’s a pretty decent return. So that’s my squad and I’m now 4 games into this season. However, it hasn’t gone to plan so far. I’ve played 4, lost 4. My saving grace was a 4-0 victory at Birmingham in the League cup with Graham bagging a hat trick. My opening game was United at home, perfect fixture right?! Anyway, after a goalless first half I actually took the lead through Zaha. They equalised via a dubious penalty and then 86 minutes Fredericks gets a second yellow. 91st minute they swing in a corner, Rabiot gives away a penalty for pushing and they score it. Unbelievable. Second game was just as frustrating. 8 minutes (yes 8) Darikwa who was covering for Fredericks is given a second yellow and we’re down to 10 AGAIN. I manage to lead 1-0 and then 2-1 but eventually they got it to 4-2. Their fourth was also a penalty. I got another back but got beat 4-3. Arsenal outplayed me 3-0 and then WBA have just beat me at home 3-1. It was 1-1 until I went down to ten men AGAIN. Richards sent off for two bookings this time. So things can only get better from here, hopefully can pick up the first points and first win sooner rather than later and that will probably happen If I can sort out the discipline! Got a few days off now so hoping to spend a fair bit of time on this save. Good luck to all! Debating wether to make Millwall, MK Dons or Sheffield United my next project. Will most likely pick Millwall just got the sheer fact of them being in league 1. Hopefully later on this after noon ill be able to set it up. Great updates by the way lads. 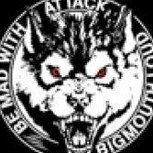 We beat BMG at home 1-0 and lost 2-1 away, so went through on away goals. Had a lucky draw for the next rounds as well. In the quarters we'll be facing Frankfurt, whom we already beat twice in the group stage. If we make it to the semis, we'll be facing either Benfica or Norwich, so decent luck there as well. The other QF ties are Udinese vs. Inter and Man City vs. Leverkusen. Will be interesting. Fixture congestion is looking rather silly at the moment. We've only played one league game in the last month, a 1-0 added time win at home against Norwich. We also booked another match at Wembley by beating Liverpool in the FA cup quarters. Not a very good performance from us, one of their CB's got sent off after 20 mins but they still managed to dominate the game and in the end we were pretty lucky to win 2-1. We'll be facing United in the semi. A special mention to Son Heung-Min who's been excellent. 10 starts, 5 times subbed in, 10 goals and 3 assists. Great achievement, Crewe are regulary rubbish in my saves. Looks like in my current save they're 21st in League 2 atm. Patrick Roberts should be a great signing, especially at that price! I tried to sign him in January 2019 but City wanted around 30-40 mill for him. He would've been a perfect fit for my system. On the face of it Rabiot at 2m looks like a very good deal as well, surprised he hasn't performed as he looks very good in my save. What role do you play him in? Good luck, hope you start winning and beat the drop! Hey Kozmik, just ventured into the Prem with Derby. What tactical set up are you going with? Whatever it is it's fairing well! I can't wait for the patch with the transfer updates to come out. I always wait till this point to do my annual Orient save so I've been getting excited now it's February. I feel like I've got a lot of pressure to live up to all of your achievements! TI's: slightly higher defensive line, use offside trap, much more closing down, lower tempo, play out of defense. That's the template. I very rarely change the PI's, but most of the other stuff including player roles (mainly WB->FB when facing high quality wingers) I do change from game to game. Also I push the advanced midfielder to AM and DLP to CM when playing against a 4123 or a 4141. I also have a 442 and a 532 prepared but have very rarely used them as the 4123 is a good formation against the formations most opposition teams use (442, 4231, 4411). I've kept pre-match training on tactics until we've reached a reasonable fluidity level and after that on teamwork. Against the top sides I've been changing the mentality to defensive then adjusting TI's as needed. I'll need to be doing a proper rethink next summer as, like I've said, teams are playing more cautiously against us and we're struggling to break them down. All that said, in addition to tactics it's at least as important to be ambitious in the transfer market. The aim is to always punch above my weight when signing players for the first XI. Probably a bug as there's no visible reason why the Bournemouth game would be scheduled on friday. Three games in four days will really stretch the squad even though I have two players for every position. Thankfully I postponed the decision on who to sell after signing Son till the end of the season as it gives me extra firepower off the bench now. Also Abdennour rather than being sold signed a pre-contract with PAOK so he's still with us. He's not registered for the Europa squad so can't play there but is available for the prem games. In the FA cup we didn't make it to the final, an even game against Utd but we lost 2-0. Not really that bothered with so much else going on. Anyway, hopefully I'll be back tomorrow celebrating a third place finish! I know I said I probably wouldn't be signing anyone else in this transfer window, but I just signed this gem from Boca for £6.75million. I now need to decide whether I just rotate the three strikers I have, or move Rhodes or Larsson on.. Or change our style of play and go with two up top. Decisions decisions decisions! Also in talks to sign a young full back from Boca too. Roberts has done ok but he's been in and out of the side as I have a lot of wide options. Doesn't help that he's been injured A LOT. Rabiot has been playing Centre Midfield support. Can see from his stats it doesn't really suit him but i didn't want to change my whole system for one player. I've started playing with a 442 after signing some strikers though and he should be good in the DLP role i've added. So 13th after 28 is better than i expected, especially as it took me so long to win my first game. Defensively i've got comfortably the worst record in the division, same for my discipline too but I can at least find the back of the net. I reached the League Cup semi's before bowing out 4-1 on aggregate against United who are miles head in the League so can't really complain. Got an FA Cup 5th round replay coming up too at home to Everton. I did a lot of business in January and sold many fringe players. Meyler (300k), Powell (2M), Kriz (1.5M), Gestede (525K), Darikwa (600K), Chester (300K) and Gibson (Free) all left. I brought in some great players. Michy Batshuayi was signed permanently for just 2M and has already started scoring, including all 4 in the draw with Arsenal. I then got Jores Okore in on loan and he's certainly improved my Defence but he's currently injured. Levin Oztunali was brought in on loan to replace Gibson and Adrian Marin was signed for 1.5M from Villareall to replace Kriz but he's barely played at all. My biggest signing however, was Patrick Bamford, cost me a transfer record of 7.75M but i'm expecting big things. He's got 1 in 2 starts so far but is just coming back from injury. Deadline day i got Borja Mayoral on loan from Real. I've started playing a 442 so thought i'd add another striker in case of injury. He scored on his debut. So, so far so good. I'm not expecting to go down as the gap is already 10 points but i don't think i'll finish any higher than 14th but with a nice looking balance already and a tycoon in charge things are already in place to really make some progress next season! Absolutely bloody gutted. Spurs lost their match against Southampton (gameweek 36) which meant that we only needed to win the weaker teams to secure third. Completely dominated the game but couldn't score. Their goal was a weak long shot from a poor clearance. Still, win against Arsenal and we get third. Tough ask but not impossible. The own goal was a loose ball that hit Barreira and very, very slowly trickled into the net. Özil's goal was a tap in from a loose ball after Shaw's tackle in the box. Had more than enough chances to score more goals but their GK saved everything in the second half. Still, if Spurs failed to win their last game away at Bournemouth, we'd still get third. Didn't of course see the match but looks like a draw would have been fair. In the Europa league, we faced Norwich in the semis. Their goal came from an excellent through ball to Berahino from our CB, otherwise known as a poor backpass. All their possession comes from playing with defensive/contain, slow tempo, retain possession etc for about an hour. What's particularly annoying is that we actually had a very, very good season. Finishing fourth, getting to a final and two semi finals is excellent and a lot more than I could have hoped at the start of the season. And still all I feel is gut-wrenching disappointment. Well, time to start planning for next season. Been given a 40 mill budget and 300k excess wage budget so more than enough to get more quality in. A right back, a center back and then whatever I might find on the transfer list are what I'm looking for. Very frustration end to the season kozmik, but you need to put everything in to perspective, you've had a class season! How are things with Morecambe? Haven't had a lot of time to play recently, however I've got time for a few games now, so I'll hopefully wrap up this season soon! Here's how things currently stand. Very, very tight from 2nd to 8th. Very good chance of going up there Gizmo. Off topic slightly but are Barnsley in the Championship? I can't see them in L1 but in my experience on this FM there's more chance of them going up than down. I could be wrong, it is us. Squaky bum time! Hope you manage to get that second place. Three signings in the bag. Gino Peruzzi as first choice RB, Edoardo Goldaniga as a rotation CB and Thomas Lemar from Real Madrid coming in as the unnecessary star signing that forces me to sell current players on the cheap. 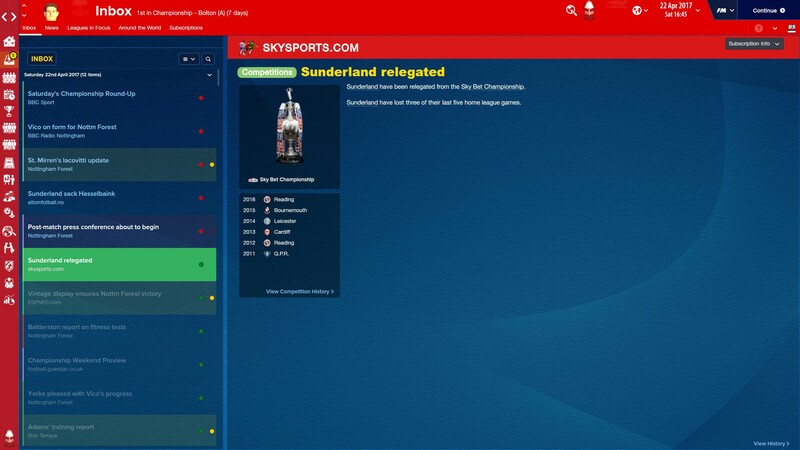 Straight back down to League 2 with two successive relegations. Finances are insecure as well. Not sure if I should feel bad or not, they got to the championship with the squad I built but in the long run I think the big wages I was dishing out chasing promotion has cost them as well. On the other hand, I'm (thankfully) not responsible for all the dross they signed after getting promoted. Here's the league table with just 2 games to go. We've completely bottled it and we're playing absolutely awful football at times now, not what you want (potentially) heading in to the play-offs. 3 Draws against Bradford, Oldham and Preston has cost us our challenge for the automatic spots. Just Portsmouth and Oxford are our remaining games to try and pick up some momentum before the play-offs. Will get this season finished tomorrow and update accordingly. I'm part way through pre-season with Coventry, and the squad is pretty much complete for our Championship return. Although there is plenty of time left, I'm not really looking to do any more deals. Hopefully these players will make the step up, especially as I have used virtually all of my transfer budget up. I have decided not to sell any of the main squad members so far. I now have quality alternatives to our key players Fleck (Norwood), Maddison (Sawyers) and Armstrong (Bradshaw) if they are injured or tired, and I think I've really strengthened my options whether it be as starters or bench players. Henry is likely to replace Haynes at left-back (although he is a bit unlucky to lose that privilege), and may be the only new man guaranteed to start. In addition he can also play on the left side of midfield if I never need him to. Clucas will generally take the vacant left-wing role following Murphy's return to Norwich, but will be encouraged to stay wide as a conventional winger instead of copying his predecessor's inside forward role. Gudmundsson is a bit of a wildcard, but one I have been monitoring for a while. He might make an impact if he ever gets an opportunity, and if he looks good I might try and take him permanently when his PSV deal expires next summer. Reice Charles-Cook, Lee Burge; Neal Eardley, Aaron Phillips, Jordan Willis, Curtis Nelson, Cameron Carter-Vickers (loan), Reda Johnson, Rico Henry, Ryan Haynes; John Fleck, Oliver Norwood, Conor Thomas, George Saville, James Maddison, Romaine Sawyers, Albert Gudmundsson (loan), Sam Clucas, Jim O'Brien, Joe Lolley; Adam Armstrong (loan), Tom Bradshaw. I've also kicked on with my Blackpool rescue mission, taking them over for the 2016/2017 season after they were relegated to League 2. I'll probably update on them next. Wow, someone actually took notice! I have a long-standing tradition of naming my (English) FM managers after Monty Python actors. Except Terry Jones, that's a completely unappealing name. And my least favorite Python member as well. Ah, who could ever forget John Cleese, the greatest manager Manchester United have ever had (on several different editions of FM). The January window has just shut in my second season. The window itself was very quiet for me. The only piece of business was a departure. Junior Stanislas was unhappy with his role in the side and I have moved him on. we managed to get 100k more for him than we bought him for one year ago. He has joined St Johnstone for £600k. I had £2.5m in the Transfer budget, but the balance was not so good. I was tempted to make one big signing to help our push for promotion. But in the end I opted to stick with what we have. It is looking good for us. The same has pretty much been opposite to last year. Where we had scored a ton and also conceded loads. Both are a lot less. It seems to be for the better. I am happy to sacrifice the goals, as we have an excellent defensive record. I need to try and find a way of scoring more goals if possible. A lot less goals. We are much harder to beat this year, this has meant we don't smash teams as much, but if this takes me up I will be very happy. We are playing some lovely football still, just missing a bit of the end product. Hopefully the season continues as it has and we can get to the premier league. Nice updates all. Jogo good business in the window. Norwood on a free is excellent, would never have guessed the Walsall 3, but good buys. I have been looking at Bradshaw. Gizmo - Hopefully you can regain some form, just in time for the play offs. Kozmik - Congrats on Manager of the year. Cheers sammo. Yes, happy with all my signings for our return to the second tier. I think Norwood is only on about £6k per week, so a very good free transfer. I used to keep Fleck on the pitch longer than necessary in games when he was at 65% or less condition, just because of his set-piece ability. Now with Norwood even better at them, it's going to make sensible choices much easier. The same with Maddison, who had a stamina stat of 7 (now 8 I think) which was meaning he tired within an hour every week. Now, I can just bring on Sawyers and it's like for like in assets. Bradshaw scored well for Walsall in these last two seasons, and will be on the bench as I only play one striker. Should be a lovely back-up to Armstrong though. You'll be surprised to hear I was 50/50 on signing HRK from Leeds - wages of about £4k per week and a fee of about £250k was tempting! Good to see you're doing well this season and I am liking your better defensive performances. Keep up the good work! @kozmik: I try to pay attention! I have been creating special manager ID's this year too. At Grasshoppers my manager is called Swiss Roll, at Marseille it's Le Grand Fromage, at Blackpool it's Matthew Stanley (might need to think randomly on that one) and at Coventry it's Jimmy Hill Jr. My other games are set as Roy Race...for anybody who knows who he was! Right, we're about to embark on a pre-season tour to China, followed by a tour of USA. So far six players have left and five arrived. Abdennour, Javi Manquillo, Raphael Diarra, Stefan Strandberg, George Thorne and Ricardo Kishna have left. In addition to those three mentioned earlier I've signed Sergi Samper from Barca and Milos Veljkovic from Palace. I didn't originally plan more signings than the three mentioned (Peruzzi, Goldaniga, Lemar) but then I noticed Samper was transfer listed for 3 mill. He was one of my favorite players in FM15 and I'm yet to use him in this years game, so I immediately jumped at the chance. That meant that Thorne, who has been the 2nd choice DLP/D so far, didn't have a place in the squad anymore, so had to sell him. And as I was already struggling to meet the HG quotas I searched for a suitable HG player and ended up signing Veljkovic, who looks like a very good rotation CB. That left Diarra without a place in the squad, so flogged him to Newcastle for 4 mill. Long term contract with a very reasonable wage and no release clause. So happy. Have had plenty of offers for my players. City and Atletico both bid for Telles, United and Spurs bid for Hughes, Spurs bid for both Shaw and Sane and Roma bid for Lucas Silva. Silva was the only one to throw a hissy fit, had to promise him a new contract to calm him down. Got to love Hughes, I've had offers for him from several bigger clubs during our two years in the prem, have driven bidders away with unreasonable demands and he has never ever complained or requested a new contract. Even though he could easily double, maybe even triple his wages if he were to move to, say, United, as he's on 53k per week. Won't be buying any more players, unless current players leave. Barcelona are apparently interested in Angel Correa, if they come in with a bid I might consider it as he's now behind Renato Sanches in the pecking order. I still have Rony Lopes who could take Correa's place, as he technically has no place in the squad currently. I've yet to decide what to do with him, he's too good to be kept on as an emergency backup but as he can easily perform on either wing or CM/A he could be useful when the inevitable injuries occur. We were unseeded in the draw and didn't get much luck. Not the toughest possible draw as Bayern was a possibility too, but would've much preferred Sporting, Inter or Shakhtar to Atletico. Still, their squad seems to have gone downhill a bit, so we've definitely a chance. But it won't be easy. Made the mistake of applying for Fleetwood town in January as they were 24th in league 1. The board wants me to play defensive soccer, so that's what I'm doing. We are now 20th but piling on the debt! Good luck with your slightly different challenges kozmik and pete! Atletico played with a narrow diamond, which I absolutely hate playing against. I went with the risky, aggressive option of 4123 with control mentality. We were by and large the better team but weren't clinical enough in front of goal and of course conceded a penalty. Their second was a counter attack where they just cut through our defense down the middle. For the second leg, I knew I had to be tighter down the middle or they would overrun me. I had a 4231DM system ready, so went with that with slight tweaks, more defensive down the middle and more aggressive on the flanks. Defensive, very fluid. Not the easiest possible group but interesting, and at least we avoided the really big guns Real, Barca et al. We're not without our chances, but would be satisfied with a 3rd place finish and Europa in the second half of the season. Anyone else gonna have a go with Middlesbrough after the January transfer update patch? We are going up, we are going up... As Champions. We didn't really get that close to beating the 106 side, but it was still a great season. We won it by 6 points in the end. The best defence in the leage by a mile, not the best attack, however we did play football that was very pleasing on the eye. We average 64% possession and scored some wonderful team goals. Unfortunately, we could not match last seasons FA cup run. We lost at Palace 2-0. Most games were close with us usually winning by the odd goal. Promotion and the title were won on the penultimate game of the season at home to QPR. Dwight Gayle, the top scorer, doing what he does best slamming the penalty home. Wrapping it up early, meant on the final day I could try something. I played a team of only players that had come through the academy. A proud moment for the club, not only that but we managed to win at the Valley. Samuel and Fosu scoring the goals. Next season will be a big challenge. £9m to spend, i'm very tempted to give the majority of this side a crack at staying up. We will see. I've been yet again given money to make some January signings... 50 million. No clear idea how to spend it yet. Domenico Berardi is transfer listed at United for 29 million, but I'm not sure he's really worth it, good as he is. Especially as he's on 235k so would likely need to get United to pay a big chunk of his wages. Pretty tight, but we're in a good position for now. Only played United (at home, 1-1) and Spurs (away, 2-2) out of the top teams so far. In December we've got a nasty run of Arsenal(A), City(H), Liverpool(A) and Chelsea(H) where we'll most likely be dropping points. Then it's two more games until the halfway point. Hopefully we'll be in a similar position still. Board expectation is only mid table, but I'm aiming for a top three finish. I want champions league again next season and definitely want to avoid the playoff round. Looking better than expected, although away to Schalke and Juve at home still to play so we could still miss out on qualification. A draw at Schalke would see us through, at home we beat them 3-1 so I'm slightly hopeful. Away to Juve we lost 4-1 and I'm not expecting much better at home, so Schalke will be a crucial game. Just started a Sheffield Wednesday save, and after two pre-season friendlies, Ross Wallace breaks his leg and is out for 6 to 7 months... Now I definitely need a new AML. Trying to get Aarons in on loan, but might go for another one as well, if the right one becomes available. Edit: And now Alex Lopez for 5 weeks, just before the first match of the season. This is going great. I've signed Dwight Gayle for £3,2 million and Rolando Aarons on loan for the season. I beat Bristol City 2-0 on the opening day of the league, and Accrington 3-0 in the 1st round of the Capital One Cup. How hard is League Two!!!! Fantastic. Possible draws for next round are Basel, Shakhtar, CSKA Moscow, Real and Valencia. I've a hunch we'll draw Real and get a comprehensive battering. Wow, this thread's gone quiet. How's everybody getting on with their saves? I ended up doing quite a lot of business in January. Initially I signed Berardi and Joe Bryan (backup DL, needed a HG player), sold Ince, Telles and Lopes. Then around mid-January PSG made a bid for Srdjan Babic, a CB I've been looking at for over a year and tried to sign last summer but he wasn't interested. Had to try and snap him up, and managed to as well! Though I had to give him a very good contract. But he looks like a very good player. Then sold Wimmer back to Newcastle (for a loss of 6-7 mill...) as he wasn't needed anymore. Immediately made a new offer for him. Not only did Berardi accept an offer that was (marginally, but still) worse for him than what I'd already offered to the agent, I also saved a good chunk of money as I didn't have to pay the agent fee. Top four is really tight but we're in a good position. We drew Shakhtar in the champions league so have a decent chance at progressing further. Nice work Kozmik. Especially on your champions league run. Berardi at Derby, never thought I'd see that. I've just begun life in the prem with Reading. Trying desperately to hang onto Jordan Obita with a couple of days left in the window. Should have an update this evening when I'm back home.